Convertible was equipped with a big 2.9L straight-6 that produced 150hp. Austin-Healey 3000 was open British sports car and it is widely considered as an iconic example of its era. Austin-Healey raced on many famous tracks such as Sebring, Le Mans, Bathurst and it enjoyed some success as a rally car. While all Austin-Healey 3000s are very good looking, the MkIII has always been the most desirable. 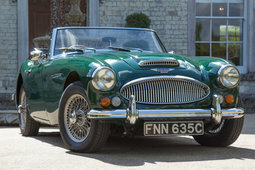 Austin-Healey 3000 was the final model of the beloved 'big Healey' and represents the highest refinement of the marque. 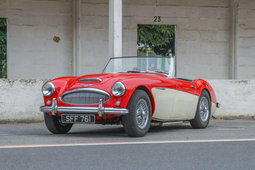 The Brits have developed a number of excellent sports cars, and the Austin-Healey 3000, which is an icon from the sixties, is often mentioned among them. This roadster had quite a short life but its legacy in the history of classical cars lives on. The godfather of this car and brand was Donald Healey, the champion of the Monte Carlo Rally in 1931 and one of most revered names in the UK car industry. After the end of the World War II he was determined to create a widely affordable two-seater sports car. D. Healey was an excellent designer and engineer, who believed that the market needed something between the primitive MG TD and the luxurious Jaguar XK 120. With the help of his son Geoff and a small team, he was able to make his vision true in 1952 after he made a deal with the Austin company. He founded a new brand and launched the Austin-Healey 100. Although his first creation enjoyed a favorable reception, its successor, the Model 3000, is the one we remember today. It was the last of big Healeys before the start of the smaller Sprite range. 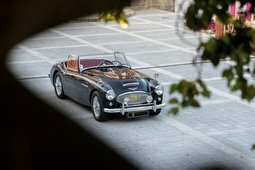 It shared many features with its predecessor, the Austin-Healey 100-6 - just the new engine, serial number, and name were different. This nearly identical design caused lots of frustrated sighs, but still the majority of car magazines considered the Austin-Healey 3000 among the best in terms of the cost/quality ratio. Its successful performance in some of the most prestigious tracks such as Sebring, Le Mans, Bathurst, etc. 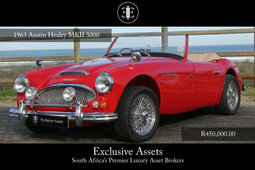 also significantly promoted the positive image of the Austin-Healey 3000. It was one of the fastest cars of its time - the rally versions could accelerate to 100 kph just in 6 seconds. This is the reason why the Austin-Healeys specifically designed for the race by the British Motor Corporation (BMC) have the highest sales value. An embodiment of the ideals of its time and possessing a charm that could not be destroyed by time, the car was produced from 1959 through 1967. Initially both two-seater and 2+2 versions were offered, but only the latter remain. The first two generations were not regarded as highly as the representative of the 3rd generation (serial number BJ8) that was presented in late 1963 and surpassed its predecessors both in terms of equipment and power. It had a huge 2.9 l 6-cylinder engine that was capable of generating 150 hp (i.e. 16 hp more than the second generation cars), which was quite an achievement for a car weighing just over 1100 kg. It could achieve a 195 kph maximum speed, and had a 4-step manual transmission and front disc brakes. It had controlled side windows as a part of the standard package and a roof that was controlled with "just a flick of the hand". Its interior was considerably upgraded with the introduction of wooden surfaces. The suspension upgrade also resulted in ride quality improvements. It was the crowning achievement of the Austin-Healey brand. Although drivers on both sides of the Atlantic were fascinated with the beautiful lines of Austin-Healey 3000, this model was not so good in terms of driving comfort and noise insulation. Other similar cars from the sixties, such as the MGB or Sunbeam Alpine, were universally better and cheaper. The Austin-Healey 3000 is often compared with the Jaguar E-Type, which is another British icon. Both were produced in the same period, but the E-Type enjoyed a longer life. This was to be expected considering the Jaguar flagship's mesmerizing driving experience and lower maintenance requirements. 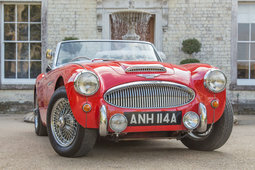 This is why the Austin-Healey never fetched a high auction price. 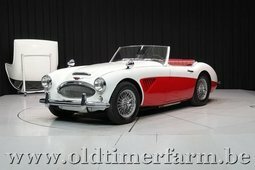 Despite the 3000 being the best Austin-Healey model, the time of its fame was quite short. The decline in its popularity was mainly caused by a lack of changes over the decade of its production, which was perceived as a significant flaw, especially in such fashion-focused markets as California where about as half of the Austin-Healeys were sold at the time. At this time, Autocar wrote, "repeated model upgrades can no more mask its shortcomings that are made increasingly visible by time and progress." 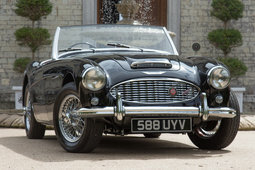 After new US car safety regulations were announced in 1967, the BMC manufacturers decided that there was no way the ageing Austin-Healey 3000 could comply, and so it was discontinued. No successor was announced - it was simply the end of the brand, although D. Healey and his son could never come to terms with this and developed a new prototype with a Rolls-Royce engine. About 44,000 Austin-Healey 3000 cars were produced in 8 years, 17,700 of which were 3rd generation models. The current price for this model starts from about 30 thousand USD, although as much as 100 thousand USD is asked for models in top condition.